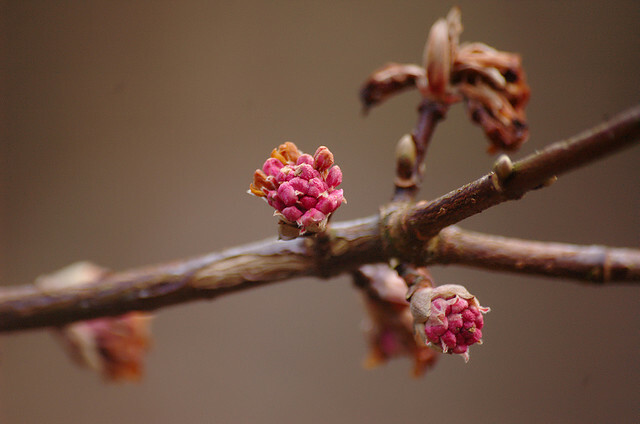 This month’s Garden Flowers post, which I write with Rona Wheeldon of Flowerona, features Viburnum x bodnantense ‘Dawn’. At this time of year when our gardens can tend to look a little bit bare, it’s wonderful to have a flowering shrub to brighten up your borders. 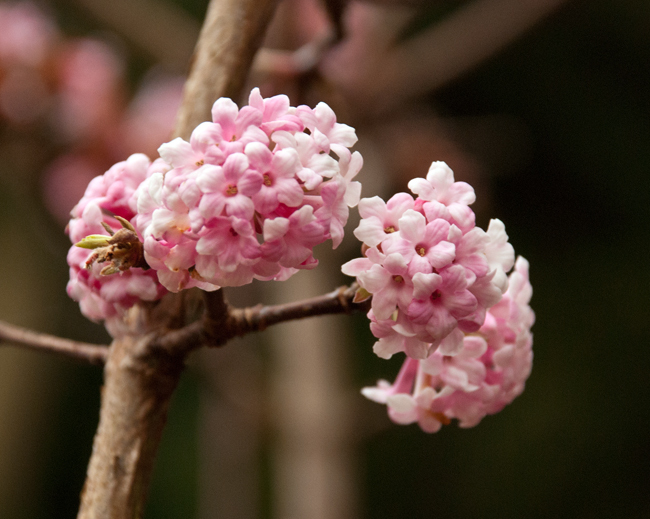 This particular variety of Viburnum is just the ticket, with its clusters of pretty tubular flowers which also have a heavenly fragrance. 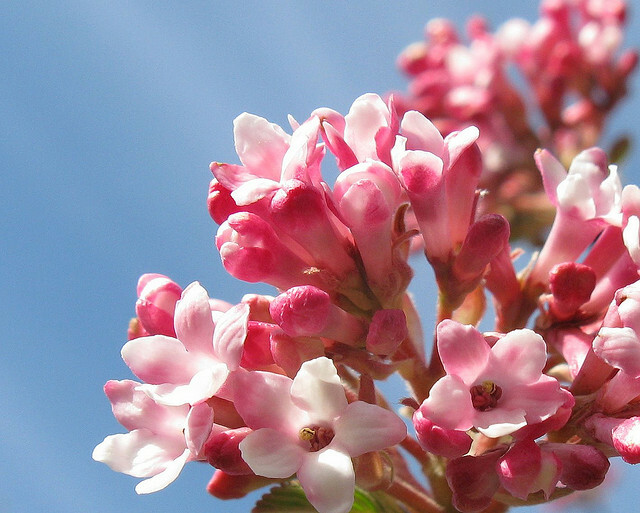 When the blooms initially appear, they are deep pink buds, which then open into light pink and white flowers. They continue flowering on the plant from late autumn into early spring. 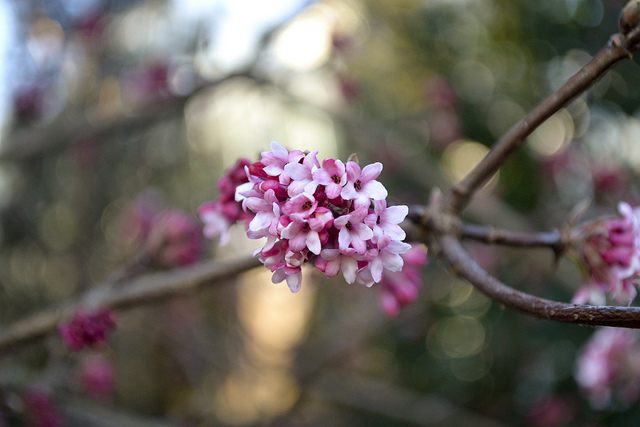 Viburnum x bodnantense ‘Dawn’ prefers to be planted in a sunny site, but will also be happy in dappled shade. And it likes moderately fertile, well-drained soil. It works particularly well planted next to a pathway where the scent can really be appreciated. With its oval shaped dark green leaves, the shrub is hardy which means that it can cope with low temperatures and the flowers are generally frost resistant. 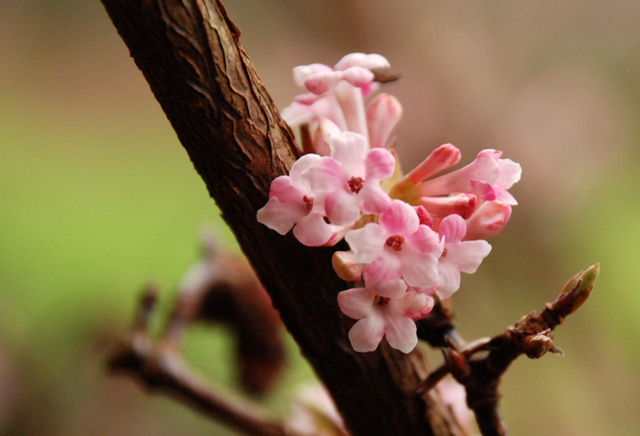 Apart from the ‘Dawn’ variety, there are two other varieties of Viburnum x bodnantense…Viburnum x bodnantense ‘Deben’ and Viburnum x bodnantense ‘Charles Lamont’. Do cut sprigs from the shrub to decorate your home, as the cut flowers last a long time. The cut stems benefit from being seared in boiling water so that the petals hold.